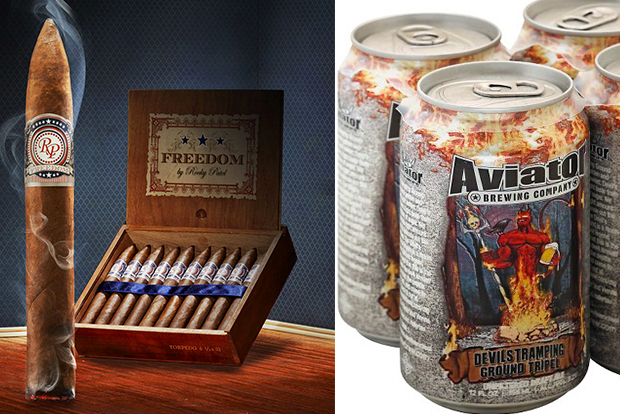 There’s no better way to celebrate America’s independence than lighting up a cigar and enjoying a beer, especially when that right is under attack by the U.S. Food and Drug Administration (FDA). 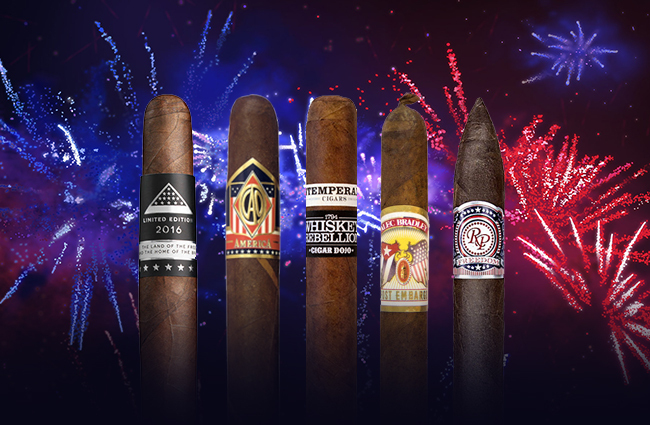 While any cigar will do, there are some patriotic and American-themed cigars that are particularly apt for Independence Day. 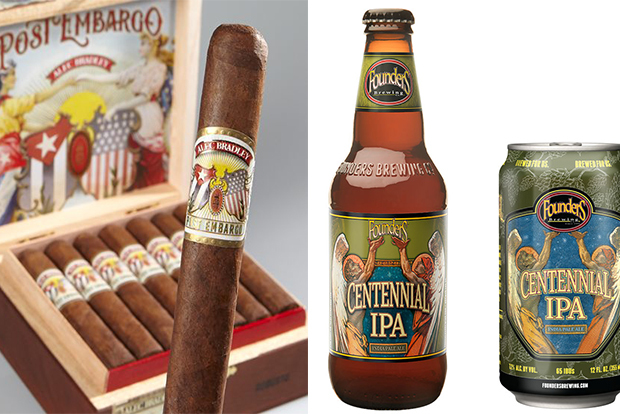 Here are our picks for cigars and beers to pair on for your Fourth of July festivities. Camacho Cigars releases its popular Liberty Series cigar every year around Independence Day. Our favorite so far was the 2016 cigar, which featured a blend from five different countries and artwork of a folded black and white flag with 14 stars, celebrating the cigar’s 14th anniversary. The band and box also included the phrase, “The Land of the Free and the Home of the Brave.” How much more American can you get? This medium-bodied cigar would pair perfectly with the herbal hops of a Fat Tire Belgian-style ale from New Belgium out of Colorado. 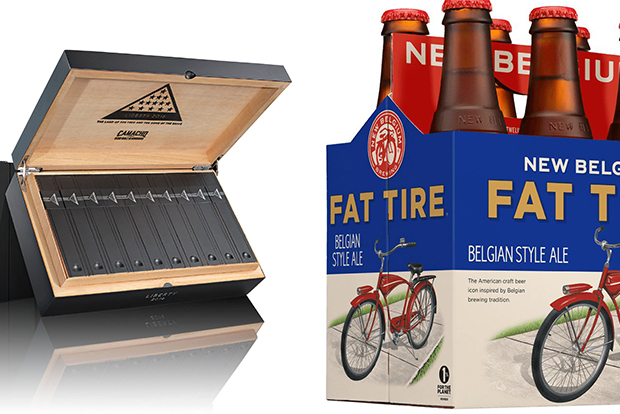 For more info, visit camachocigars.com and newbelgium.com. This cigar from Alec Bradley pays homage to the 1960s when the embargo against Cuba began. 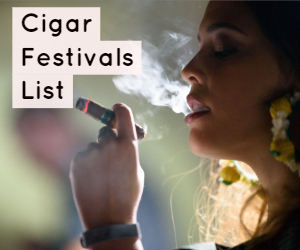 This historic period sent the cigar community into a frenzy when Cuban cigars suddenly became outlawed in the U.S. This embargo led to the many varieties and popular brands of today; it also forced some to resort to bootlegging or counterfeiting in pursuit of a Cuban cigar. Post Embargo is a medium to full cigar with a Honduran wrapper and binder with filler from Nicaragua and Honduras. 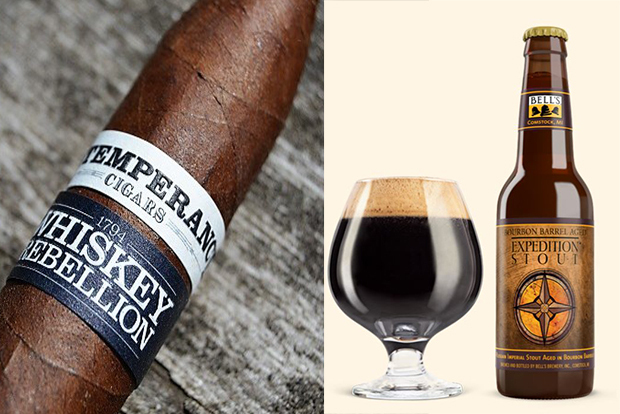 The Centennial IPA from Founders Brewing in Michigan, which boasts citrusy accents and a hoppy finish, would pair nicely with this spicy and nutty cigar. For more info, visit alecbradley.com and foundersbrewing.com. This is an all-American cigar with two of its wrappers grown within the U.S.—a Connecticut Broadleaf and Connecticut Shade. This cigar is a melting pot of different countries coming together to form one great body of work. 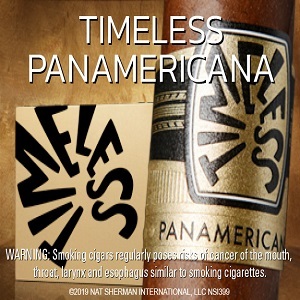 It has a Brazilian binder and fillers from Nicaragua, Italy, Dominican Republic, and the U.S. It’s a full-bodied cigar with each stick named after various American icons such as Potomac, Monument, Landmark, Constitution, and Bottle Rocket. 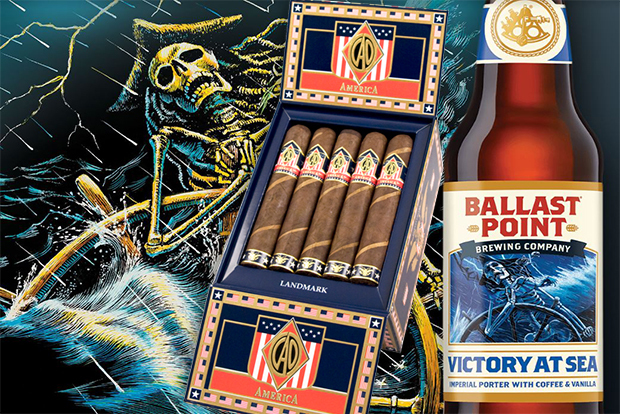 Pair this full-bodied, rich cigar with the equally robust and aromatic Victory at Sea Imperial Porter with Coffee & Vanilla from Ballast Point Brewing Company in California. 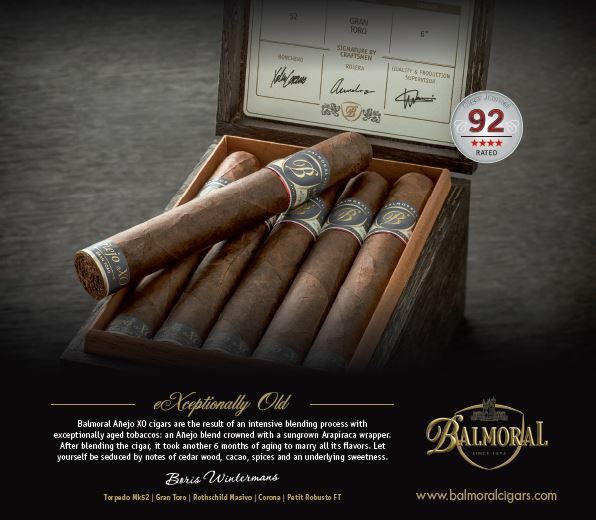 For more info, visit caocigars.com and ballastpoint.com. This cigar is a collaboration between Cigar Dojo and RoMa Craft Tobac, and it is named after the Whiskey Rebellion of 1794 where farmers in western Pennsylvania rebelled against whiskey being taxed. 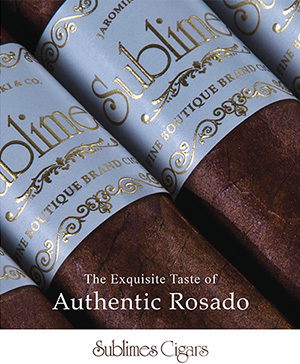 It’s a limited-edition cigar available exclusively to members of Cigar Dojo and can be purchased from Famous Smoke Shop. You can expect a full-bodied smoke with flavors of earth, sweet spices, and espresso. Join that espresso taste with something equally dark, like an Expedition Stout from Bell’s in Michigan. This bourbon barrel-aged 10.5% ABV beer will make an excellent companion to your own whiskey rebellion, if that’s what you so choose to do. After all, it is America Day! For more info, visit cigardojo.com and bellsbeer.com. Rocky Patel released the Freedom cigar in response to the cigar industry’s fight against taxation and government regulation. It’s a full-bodied cigar that’s bold, powerful, and uncompromising, much like Rocky Patel himself. The Nicaraguan fillers give the cigar a burst of spicy and nutty flavors, and the finish is long and heavy. An excellent pairing with this flavorful and heavy smoke is Devil’s Tramping Ground Tripel from Aviator Brewing. It has fruity and spicy flavors with a lightly sweet finish, so you’d never guess that this one will sneak up on you with its 9.2% ABV. For more info, visit rockypatel.com and aviatorbrew.com. On this Independence Day, don’t forget our troops; donate to Cigars for Warriors, a charity that collects and dispenses premium cigars to troops. For more info, visit cigarsforwarriors.org.